Export version of the MiG-21SM, with RP-22 radar and R13-300 turbojet. The choice of weapons loads was increased with the addition of the R-60 (NATO: AA-8 "Aphid") and later the R-60M IR-seeking AAM. These were also licence-built in India by HAL as the Type 88. Bulgarian local designation for MiG-21MF modified to carry recce pods after the retirement of the MiG-21F-13R. Czech Air Force designation for MiG-21MF upgraded with NATO standard avionics. 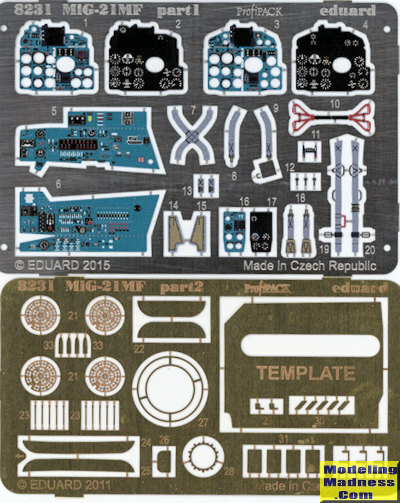 Eduard has gotten a lot of positive press regarding its MiG-21 line. Since the MF came in more interesting camo schemes that probably any other variant, I picked this one up when it showed up on the shelves of the LHS. This is the Profipak version so has additional bits included such as photo etch and a set of canopy and antenna masks. One of the two photo etch frets is a color zoom set for the cockpit. This includes belts, two different main instrument panels, and side panels. The other is for the gun gas deflectors, wing fences, brake discs and bits for the exhaust among others. A scribing template is also provided. The kit has a nicely done cockpit with a nicely done bang seat. Here is where one of the p.e. frets will be used. It may be diffeicult to match Eduard's prepainted photo-etch, an issue that has always been a problem, but you should be able to get close. There are a lot of clear canopies provided, but most will not be used. The canopy can be displayed open. The wheel wells are very nicely detailed and all separate bits that eventually fit into the fuselage halves. There are also a number of bulkheads that go in the fuselage to add stiffness. A well detailed exhaust and burner can are also provided. Eduard recommends nose weight but does not tell us how much. As this cannot be added once the fuselage halves are together, the builder will have to tape together all the major components to get the right amount. 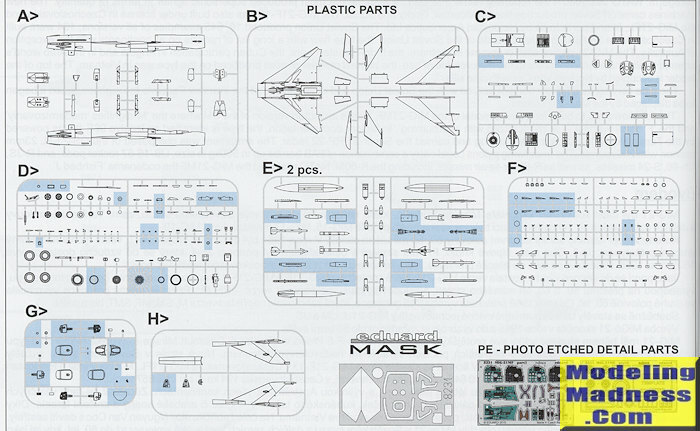 In order to be able to produce multiple variants using the same basic fuselage and wings, the upper spine and fin are separate pieces and have their own small bulkheads. In fact, it is this feature that differentiates this MF kit from the later bis version. Eduard have gotten these bits correct. Now they need to do a series of 1/72 kits. On the wings, the builder will have to assemble the multipiece wing wheel wells. Any pylons will need the holes opened up as well. The kit provides separate forward speed brakes if we want to cut away the ones molded into the bottom of the wing so these can be displayed open. I dare say few modelers will do this. There is a separate rear speed brake assembly for open or closed. Landing gear are properly complex and should look quite good when done. A goodly portion of the sprues are for fuel tanks, pylons and weapons. One will choose what one wants to use fairly late in the build process. Some of these have a multitude of small parts as Russian weapons seem to have a lot of tiny fins. Instructions are well done on slick paper that includes a full color painting and markings guide with Gunze paint references. This might be an issue where Gunze paints are not available, but since the colors are relatively common, finding local substitutes should be easy. Markings are for six different aircraft. All of these are in various camouflage schemes. First is the box art plane from Egypt, followed by a Czech and Slovakian plane. The other three are from Poland, Soviet Union (with a nice shark mouth), and East Germany. 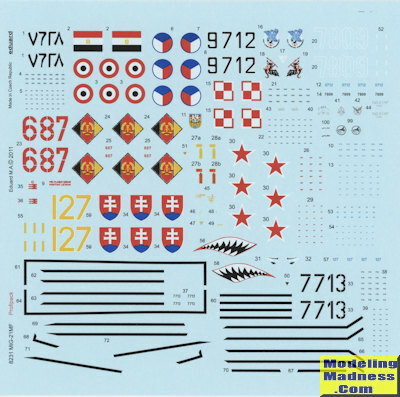 The decal sheet is very nicely done and though not shown, there is an even large sheet for stencils and weapons markings. You will have to paint the orange bits on the Egyptian planes, but Eduard has provided the broad black outlines. 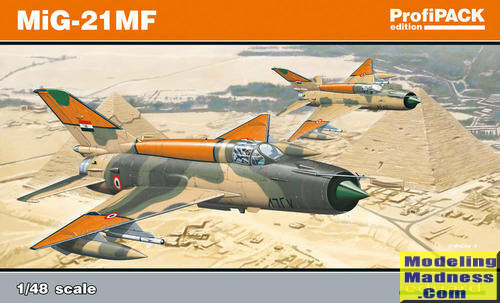 Those waiting for this one to be released can now do a proper MF in 1/48 scale. I'm sure that when this is released as a weekend edition it will be about $20 cheaper and without the masks, extensive decal selection, and photo etch. There are some great aftermarket schemes out there as well, though the ones provided in the kit are nothing to sneeze at. Thanks to your editor for picking up this one.